Daily Distractions: Dodgers sign Jesus Flores, Clayton Kershaw update, Vicente Padilla to Japan. Jesus Flores is 28 years old and has caught 263 major-league games. That makes him younger and more experienced than the Dodgers’ starter, A.J. Ellis. The Washington Nationals granted Flores free agency in November and the Dodgers signed him to a minor-league contract with an invitation to spring training on Tuesday. Flores figures to compete with Tim Federowicz for the backup job. Considering Federowicz’s lack of experience (10 major-league games), it could make for an interesting competition. Flores’ career batting numbers aren’t much to look at, though he did hit eight home runs and drive in 59 in only 90 games in 2008. The Venezuela native batted .301 in 2009, when surgery to repair a stress fracture in his right shoulder limited his season to 29 games. Flores hasn’t been the same since. He didn’t play at all in 2010 and worried whether his career was over. 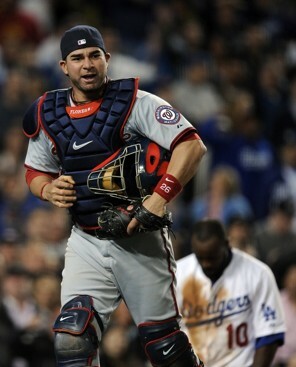 He came back to play 30 games in 2011 and 83 last season, all in a backup role for the Nationals. His slash line since the surgery: .212/.249/.325. Even Flores’ defense seems to have suffered; since the surgery he’s thrown out only 13 of 67 attempted base stealers – 19.4 percent. Flores is currently playing for Navegantes del Magallanes of the Venezuelan Winter League. • Former Dodgers pitcher Vicente Padilla signed with the SoftBank Hawks in Japan, according to multiple reports. What’s your favorite Vicente Padilla memory? • Maybe it’s not surprising to see Hanley Ramirez‘s name appear in a list of the majors’ worst defensive players. But check out the bottom four players in Defensive Runs Saved over the last three seasons, courtesy ESPN’s Mark Simon: Matt Kemp (-55), Rickie Weeks (-51), Hanley Ramirez (-50), Yuniesky Betancourt (-45). • Today is Alfredo Amezaga’s 35th birthday. • Today also would have been Frank Zamboni’s 112th birthday. Zamboni invented his patented ice-resurfacing machine in Paramount in the 1940s. Google has commemorated his invention on its home page today. This entry was posted in Daily Distractions, Hot Stove, JP on the Dodgers and tagged A.J. Ellis, Hall of Fame, Jesus Flores, Matt Kemp, music, Tim Federowicz, Vicente Padilla by J.P. Hoornstra. Bookmark the permalink.